The Crew 2 is getting ready to join the starting line for its launch on June 29th. To ensure the best experience to all our players, it was key to the development team to improve the game for all platforms. This is especially the case for PC players as the customization of all options and settings are critical to deliver a great gameplay experience to a variety of unique setups. 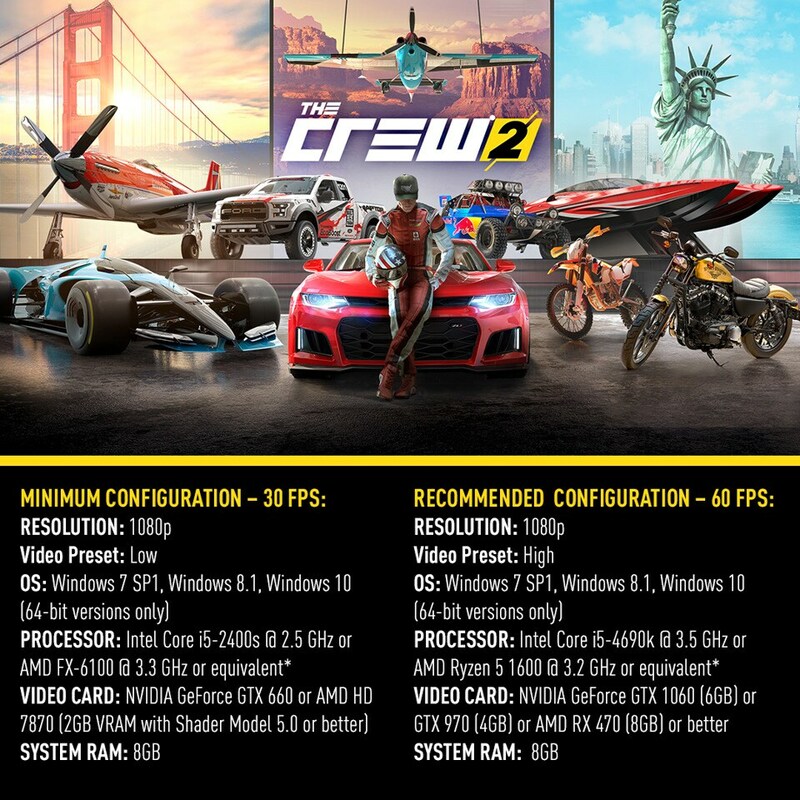 Today, we are pleased to share with you an overview of the PC version of The Crew 2, as well as the official recommended specs for the game. We highly recommend you to check the following specs recommendations for best experience on PC. In order to offer a customised experience to every PC players, we included a variety of settings to suit their unique setup. Of course, automatically detected presets also are available. ○ Geometry: Set the view distance details. ○ Shadows: Set the resolution and quality of all shadows in the game. ○ Textures: Set the quality of in game textures. Game restart is required to apply changes. ○ Environment Mapping: Set the quality & the resolution of realtime reflection & indirect lighting. ○ Grass: Set the density of grass in the game environments. ○ Anti-aliasing: Set the quality of edge sharpening and overall graphic fidelity. ○ Screen space reflection: SSR allows improving even more Environment Mapping by using some parts of the rendered image if possible. The player can choose SSR quality or disable it for low-end machine. ○ 3 Monitor FOV scale factor: If the player uses a 3 monitors configuration, this value allows him to focus more or less the view on the monitor in the middle and corrects potential FOV deformation because of the unusual aspect ration. If you want to go even further, mechanical customization also is available for each vehicles in the game! Please note that additional devices may be compatible by default or with further setup.